Legend has it that the Sharifi family of Unani Hakims had its beginnings with Abu Bakr Siddique, a personal companion of the Prophet Muhammad, PBUH, but the actual evidence to support this claim is rather sparse. The first family forebear for whom there is solid evidence in the form of documentation and historical artifacts is Nasiruddin Khwaja UbaidullahAhrar (1404 – 1490 CE). The title “Khwaja” means a spiritual master, and Nasiruddin Ahrar was Grand Shaykh of the Naqshbandi Order of Sufis, which traces their spiritual lineage all the way back to the Prophet Muhammad, PBUH, himself. Shaykh Ahrar was the twentieth Grand Shaykh in the Golden Chain of succession for the Naqshbandi Order, which is one of the leading orders of Sufism, especially in central Asia and the Indian subcontinent. Many central Asian rulers and potentates were his fervent disciples, including the great grandson of Tamerlane the Conqueror, the Ottoman Sultan Muhammad II Al Fateh, who went on to conquer Constantinople, and Zahiruddin Muhammad Babur, who went on to conquer north India and establish the Mughal dynasty. And so, the initial occupation of the Sharifi family was not as Unani Hakims, but as Sufi Saykhs, mystics and spiritual advisers. The family accompanied Babur on his expeditions of conquest into the Indian subcontinent, advising him on his battle tactics and strategies via a special art of prayer for guidance called Istikhara. The prayer oracle was invoked at dawn, and based on its results, Babur was advised whether or not to go into battle that day, and how, and with whom to fight. The family ancestor who accompanied Babur on his expedition of conquest seems to have been Khwaja Muhammad Sultan, who was born in Herat, Afghanistan, and died in the Deccan in India in 1570 CE. The title “Khwaja”, denoting a spiritual master, has been inherited and claimed by every descendant and scion of the family lineage since its founding, and Sufi mysticism and spirituality has been an integral part of the family tradition ever since. Rooted in the healing of the mind and spirit as well as the body, the Unani Hakims of the Sharifi family, in keeping with family tradition, have had to master not only the art of Unani medicine, but also religion, spirituality and philosophy as well. Nuruddin Khwaja Mullah Ali Qari Al-Hanafi Al-Haravi was also born in Herat and followed Babur the Conqueror and first Mughal emperor into India. He was a prominent religious scholar of his day, and a prolific writer who penned some forty extant works. He migrated from Hyderabad in the Deccan to the imperial court in Agra in 1556 CE. During the reign of Akbar the Great, Nuruddin held the position of Shaykh Al-Mashaykh, or “Shaykh of Shaykhs” as a prominent religious leader in the Mughal court. Nuruddin was followed by Khwaja Mullah Ali Daoud, a Sufi mystic and religious scholar who was responsible for religious affairs under the emperor Jahangir. Mullah Ali Daoud passed away in 1630 CE in Agra, and with him went the primary family occupation of being Sufi Shaykhs and spiritual advisers. Hakim Khwaja Muhammad Fazil Khan was the royal Hakim at the court of Shah Jahan, the builder of the Taj Mahal, and was the first Hakim of the Sharifi family in India. Actually, there were two first Hakims of the Sharifi family in India; in addition to Fazil Khan, his brother, Hakim Ajmal Khan I accompanied him into the field of Unani Medicine. Let’s face it – medicine and healing is a difficult and demanding field, and the two brothers, side by side, were there to give each other moral support and constructive feedback as they took on this daunting challenge. Brothers also make the best “study buddies”. In recognition of their outstanding service to the Mughal Empire, Emperor Shah Jahan awarded both brothers with the ennobling title of Khan, which is the rough equivalent of “Sir” or knighthood in the British Empire. Fazil Khan passed away in Agra in 1670 CE. The two brothers were succeeded by Hakim Khwaja Muhammad Wasil Khan, who was a Sufi Shaykh of the Qadriya order. He migrated from Agra to Delhi, or Shah Jahanabad, founded by the previous emperor, at the beginning of Emperor Aurangzeb’s reign, in whose court he was the royal Hakim. 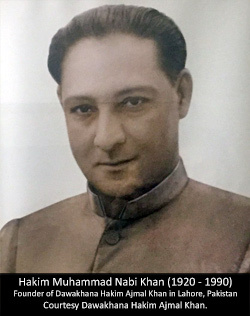 Hakim Wasil Khan was the first of the family Hakims to start the compilation of medicinal formulas or prescriptions in the realm, a process that was to culminate with Hakim Sharif Khan, from whom the Sharifi family derives its name. 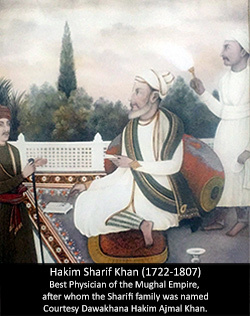 The Sharifi family lineage of Hakims faced its decisive moment of truth in the person of Hakim Khwaja Muhammad Akmal Khan, who was the royal Hakim in the court of Emperor Muhammad Shah, who awarded him with the titles Akmal al Muhaqqaqeen (Akmal the Best Diagnostician) and Haziq al Mulk (Genius of the Nation). During his tenure in the Mughal court, the Crown Prince, Ahmad Shah, impatient to ascend to the throne, ordered Hakim Akmal to poison the emperor, but the Hakim refused. When Crown Prince Ahmad Shah finally became emperor in 1748, he banished Hakim Akmal Khan from his court and confiscated all his property. Ahmad Shah later came to regret this decision and offered to reappoint Hakim Akmal back to the court, but Hakim Akmal declined the offer, and went into private practice instead. The Sharifi family’s medical fame and prowess reached its zenith in the person of Hakim Khwaja Muhammad Sharif Khan, who was born in 1722 in Delhi, and passed away in 1807 in the same city. It was from Hakim Sharif that the Sharifi family derives its name; because Hakim Sharif was based in Delhi, the Sharifi family also became known as the Delhi school of Hakims. Hakim Sharif was the royal Hakim at the court of Emperor Shah Alam II, who gave him the title Ashraf al Hokma (The Best of Physicians). Hakim Sharif was a prolific writer, and wrote some seventeen books on medicine, of which the most famous was Ilaj al Imraz, (The Cures for Diseases) which is still considered a great authority in its field. Hakim Sharif also translated the Holy Quran into Urdu, which is widely regarded as the first translation of the Quran into that language. Hakim Sharif is also famous for compiling the most complete and authoritative collection of Unani medicinal formulas into one master work. With Hakim Sharif Khan, the Sharifi family finally reached the pinnacle of the Unani medical profession in India, which also coincided with the pinnacle of Mughal political power and prestige. The life and times of Hakim Khwaja Muhammad Sadiq Ali Khan (1771 – 1848, in Delhi) saw Mughal power on the wane, and the power of the British East India Company on the rise. And so, Hakim Sadiq Ali was not a royal Hakim, but more a Hakim of the people. 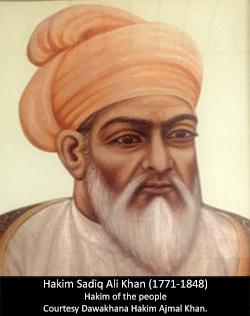 Hakim Sadiq Ali authored several books on medicine, theology, grammar and education. Hakim Khwaja Ghulam Mahmood Khan was born in Delhi in 1819, and died there in 1893. He was a great Hakim, well known for his grace and dignity. 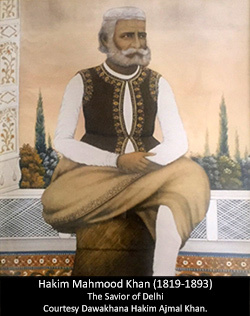 Hakim Mahmood Khan was also a great philanthropist, and was called the Savior of Delhi for his actions during the 1857 revolt, which is also known as the Sepoy Rebellion. Hakim Mahmood Khan authored two books on medicine, and also a book titled Qanoon al-Sharifi, which was a history of the Sharifi family up until that point. 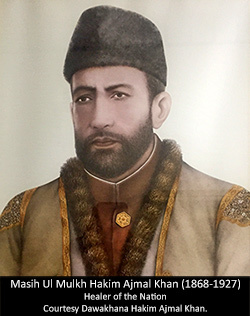 The next notable Hakim of the Sharifi family we arrive at is none other than Masih-Ul-Mulk Hakim Hafiz Khwaja Muhammad Ajmal Khan, accomplished as a poet, philosopher and politician as well as a Unani Hakim; he is the subject of the Hakim Ajmal Khan page, also in this section of the website. Hakim Ajmal Khan was born on February 9, 1868 in Delhi, andpassed away in 1927 in Rampur. A close associate of Gandhi and a leader or the Indian independence movement, Hakim Ajmal Khan renounced the title he had been given, which was Haziq-Ul-Mulk, to accept the title that the Indian people gave him, which was Masih-Ul-Mulk (Healer of the Nation). He founded the Madrassa Tibbiya (School of Tibb) in Delhi in 1890, which was finally inaugurated in 1921, along with his brothers, Hakim Abdul Majid Khan and Hakim Wasil Khan; this institution became the Medical College of Delhi. 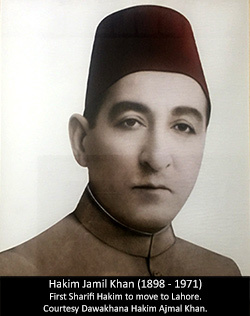 Hakim Khwaja Muhammad Jamil Khan was born on May 15, 1898, in Delhi, and died in 1971, in Lahore Pakistan. He was not only a Unani Hakim, but a botanist and a poet as well. Hakim Jamil Khan authored several books, the most famous of which is Kitab al-Mufardat (The Book of Herbs). With Hakim Jamil Khan, the Sharifi family moved from Delhi, India to Lahore, Pakistan, and has been there ever since. 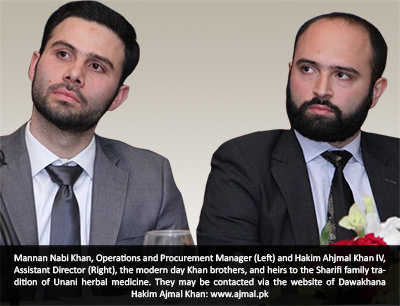 The Sharifi family now owns and operates a Dawakhana, or Unani herbal pharmaceutical company, which they named after the renowned Indian freedom fighter and Healer of the Nation – Dawakhana Hakim Ajmal Khan. 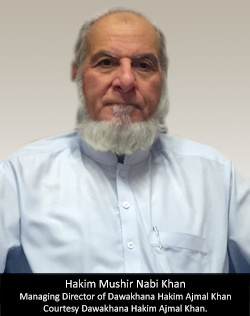 The current managing director of Dawakhana Hakim Ajmal Khan is Hakim Mushir Nabi Khan, who is assisted by his two sons, Hakim Ajmal Khan IV and Mannan Khan. Every scion of the Sharifi family, from its early origins in central Asia right down to the present day, has had the title “Khwaja”, a Sufi term for a spiritual master. The Sharifi family was therefore into the healing of the mind and spirit long before they extended their healing ministry into the medical realm. From the first Khan brothers in the Sharifi family on down to the present, all the Hakims of this family had to master not only the art of medicine, or physical healing, but also the disciplines of religion, philosophy and spirituality as well. They have recognized that a correct approach to the art of healing rests on a solid foundation of the religious and spiritual sciences. Before anything can be known about the medical art, the spiritual refinement and perfection of the knower – the individual Hakim – must take place. Only then can the assimilation of healing knowledge, free from any undue attachment or bias, begin. Only then can the physician observe and diagnose with true clarity and precision. In holistic healing, we are always striving to give the patient exactly the medicine that he or she needs at the moment, always striving to deliver just the right healing touch to restore wholeness and harmony to a broken body. And so, it behooves the healer to hone and refine his inner powers of perception and intuition as much as he can – and the foundation of any program for doing this must be a regular regimen of meditation and spiritual practice. Sometimes, physical medicines and treatments may not be enough to truly heal a person, as a broken spirit will not let the body heal. In those cases, the wise Hakim should be able to discern and isolate the spiritual malady that is giving rise to the physical symptoms, and address it in a timely manner. A true healer cannot be spiritually empty and have any hope of inspiring or motivating the patient to follow through with their treatment; only the healer who is willing to pour out from the spiritual fullness of their heart can do this. Shaykh Hakim Moinuddin Chishti, author of The Book of Sufi Healing, has written on its back cover: “To the Sufis, the healing of the sick is considered to be the most important of all services to humanity.” This book discusses not just the physical healing methods of the Sufis, through diet, herbs, medicines and exercise, but also methods of spiritual healing, like fasting, breathing exercises, meditation, prayer, and remembrance of the Holy names of God, to name a few. Many Sufi groups and organizations, even here in the United States, have healing circles, in which they practice various healing modalities, both physical and metaphysical. It is in this same spirit of holistic healing, of Body, Mind and Spirit that the Sharifi family has steadfastly pursued its mission to heal suffering humanity.